Zhongyu is the musical project of Exposé’s own Jon Davis (noted reviewer and our web master). About ten years ago Jon spent three years living and working in Beijing, China and that immersion experience revitalized his enthusiasm for music. On returning to Seattle in 2009 he continued to explore non-standard structures and tonalities, eventually connecting with kindred spirits Rik Wright (Zen Tornado) and Dennis Rea (Moraine) and forming Zhongyu. The result, “finally,” is Zhongyu, an interesting and adventurous East Meets West fusion of jazz, progressive rock, and Chinese music. Jon brought home with him a guzheng, the Chinese traditional plucked musical string instrument that is much like a zither. Jon is quite accomplished on the guzheng, that he also plays in a non-traditional mode with a bow. 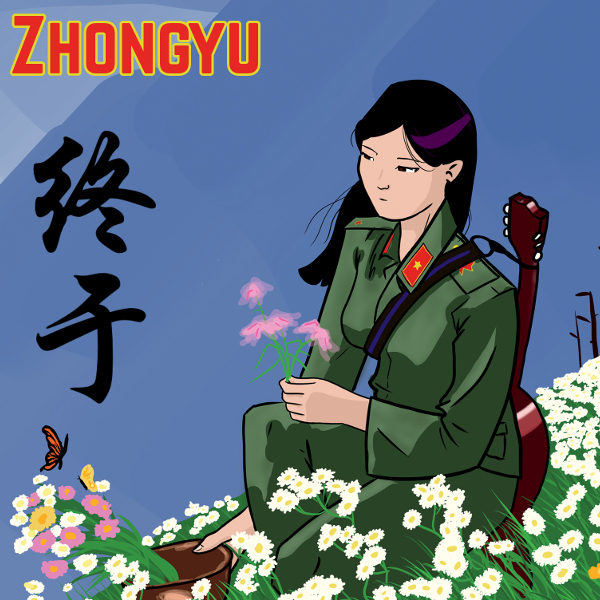 Zhongyu's twelve instrumental tracks explore multiple genres. The opening track “Apple of My Mind’s Eye 2” is an experimental track with heavy use of reverb, gongs, and sweeping analog ARP sounds. And there is a hint of a melody in there as well. The next track “Torture Chamber of Commerce” launches right into complex progressive jazz with distorted guitar, Jon’s Chapman Stick, and percussion. Fans of Present will love this track. The third track “Iron Rice Bowl Has Rusted” prominently features Jon on the guzheng, creating a hauntingly beautiful example of Chinese influenced progressive rock. Track four “Hydraulic Fracas” starts out slow with flute and some dissonance, that slowly grows on you to culminate in another fusion of world music and progressive jazz rock. This should give you a good idea of the range of music on the disc. Other noteworthy tracks are “Half Remembered Drowning Dream” which is an amorphous tone poem that sounds like it is trying to build to something, but never quite gets there, much like what you may experience when trying to draw together those elusive threads and thoughts upon awakening from a dream. Then there are the comparisons to Jade Warrior that I note on “Sleepwalking the Dog” and the closing track “All Food Comes from China.” I could go on, but suffice it to say, Zhongyu is an excellent album and something you probably have not encountered before. And since we at Exposé strive to bring attention to new and unusual musics, by all means check out the musical efforts from one our own. What first hits me as a listener on the album opener “Apple of My Mind’s Eye 2” is the strong Chinese influence, in the instrumentation, scales and percussion used, which should be no surprise when one realizes that the two principals in the band Jon Davis (Chapman Stick, guzheng, keys) and Dennis Rea (guitars) have both spent good portions of their lives living inside China, soaking up the cultural influences and music. Here, and throughout the twelve cuts presented, those influences are intertwined with a strong chamber rock feel, sometimes vaguely reminiscent of Starless era Crimson, Present, and others, though nothing to be found here sounds derivative in any way. The band also includes James DeJoie on baritone sax, flute, and bass clarinet, reinforcing the band’s chamber feel in conjunction with Alicia DeJoie’s violin, with Randy Doak’s drums providing a solid rhythmic connection on a number of levels. The push and pull of Eastern versus Western sensibilities might recall some early Jade Warrior infused with occasional Forrest Fang, but the hard driving moments on this all instrumental set are nothing short of take-no-prisoners avant rock. All these forces pulling and pushing in opposite directions makes for a powerful mix that brings home a unique musical vision that cross-pollinates a wide spectrum of ideas. Some of the pieces like “Sleepwalking the Dog” seem to be borne of improvisation, while others like “MBBL” and “Torture Chamber of Commerce” offer a more composed feel. There’s a lot of excitement to be found from one cut to the next as all these ideas compete and vie for prominence. Overall, this is definitely a strong opening statement from a band with a fresh approach.